Rian Lor Roop Muean Kroo Ba Kasem Nuea Tong Rakang Pim Song Rakang Hlang Pra Sangkajjai - Sawasdee Mee Lap Plord Pai Edition - cast brazen alchemically forged guru monk coin amulet, released in 2538 BE at the Sussaan Trailaks forest Cliff Cemetery temple. The rear face of the amulet has the image of Pra Sangkajjai Arahant embossed on the upper part of the coin. Underneath Pra Sangkajjai, are the words 'Sawasdee Mee Lap' Meaning 'Happiness Peace and Luck in Wealthy Fortunes' Pra Sangkajjai is renowned for the bestowal of Maha Lap and Maha Pokasap blessings, increasing wealth and prosperity. 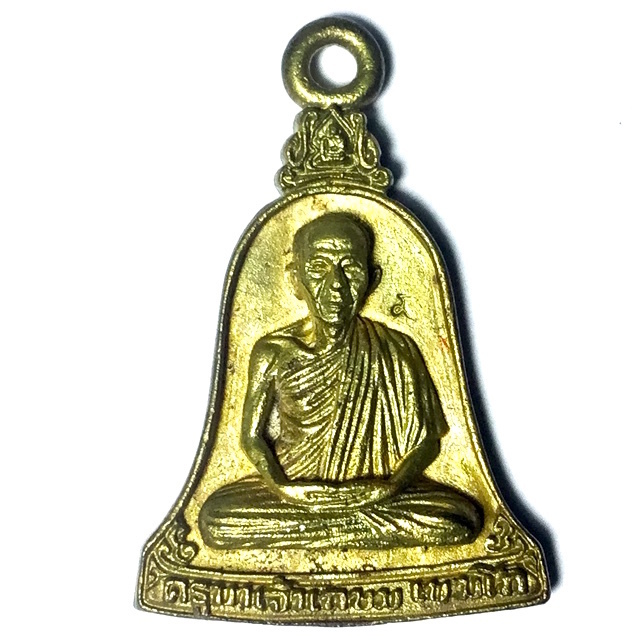 His amulets have always been very popular with Thai people even during Luang Por's early years., for the purity of practice and massive faith which the devotees had in his Patipatā (practice). Even more so since many Devotees who wore Luang Por Kasem's amulets turned up constantly at the temple over the years, telling stories of great luck in commerce, love, as well as tales of miraculous escapes from fatal accidents, and lethal attacks from enemies. This edition is one of the many popular and sought after editions of amulets made by Luang Por Kasem, and is valued by collectors and "Sian Pra" in the professional amulet collector circles. This amulet is an true masterpiece of miniature Buddhist Arts, with true old school class and style, and is a Pra Niyom Category amulet that is an immensely recommended for devotees of the Guru Monk Luang Por Kasem Khemago.